For the last year I have been taking part of the research project Voice or Chatter?, part of Making All Voices Count, a programme working towards a world in which open, effective and participatory governance is the norm and not the exception, and focusing global attention on creative and cutting-edge solutions to transform the relationship between citizens and their governments. Technopolitics, ICT-based participation in municipalities and the makings of a network of open cities. Drafting the state of the art and the case of decidim.barcelona , a working paper. State of the Art: Spain. Voice or chatter? Using a Structuration Framework Towards a Theory of ICT-mediated Citizen Engagement , a research report with the political and regulatory context of e-participation in Spain. A new article has been published from the same project. It is a shorter version of the political and regulatory context, now in Spanish. It has appeared in Revista Internacional de Pensamiento Político (issue #11), within a monograph on the digital revolution, technopolitics and digital democracy edited by Ramón Soriano and Francisco Jurado — to whom I owe much gratitude, not only for the invitation to submit a paper, but for their idea to curate such an interesting monograph. Below appear the abstract of the article in English and Spanish and the download of the full text in Spanish. The Spanish local elections in 2015 brought to many Spanish cities what has been labeled as “city councils of change”: city councils whose mayors and governing representatives come from parties emerging from the 15M Spanish Indignados Movement. This research focuses on the socio-political environment where this phenomenon takes place, specifically in Madrid and Barcelona, the two major cities of the state and featuring “city councils of change”. Our research revisits e-participation since the beginnings of the XXIst century onwards and most especially in the aftermath of the 15M Movement, proposing that recent ICT-based participation initiatives in such in municipalities could be far from just polling the citizens and be, instead, the spearhead of a technopolitics-aimed network of cities. Las elecciones municipales de España en 2015 trajeron a muchas ciudades españolas lo que se ha calificado como “ayuntamientos de cambio”: ayuntamientos cuyos alcaldes y representantes en el gobierno provienen de partidos emergentes del Movimiento del 15M. Esta investigación se centra en el entorno sociopolítico en el que se desarrolla este fenómeno, concretamente en Madrid y Barcelona, las dos mayores ciudades del estado y con “ayuntamientos de cambio”. Nuestra investigación revisita la e-Participación desde los inicios del siglo XXI y, sobre todo, tras las secuelas del 15M, proponiendo que las recientes iniciativas de participación basadas en las TIC en los municipios podrían estar lejos de ser meras encuestas para los ciudadanos para ser, en cambio, la punta de lanza de una red de ciudades tejida con prácticas tecnopolíticas. Peña-López, I. (2017). “Participación electrónica en los municipios. De la emancipación ciudadana a la red de ciudades abiertas”. In Revista Internacional de Pensamiento Político, 11, 63-88. Sevilla: Universidad Pablo de Olavide. 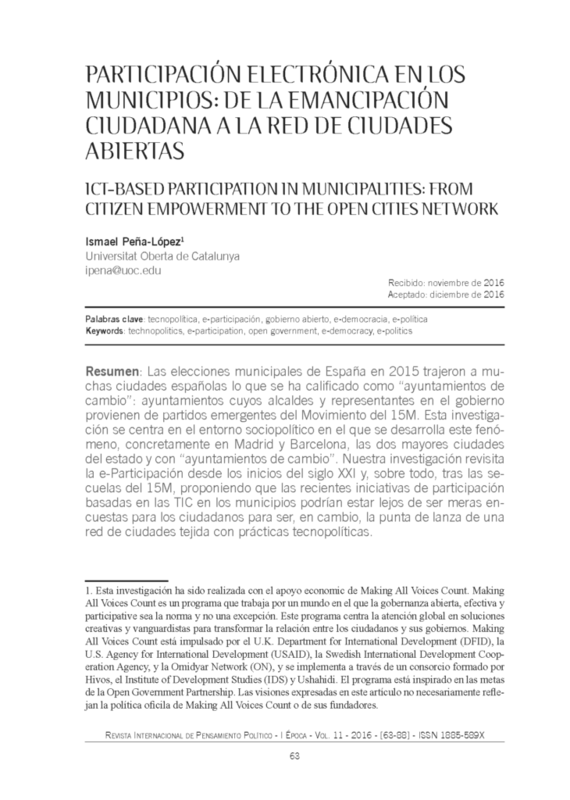 In 2009-2010, some colleagues and I did a small research for the Diputació de Barcelona (Barcelona County Council) on new ways of political participation enabled by ICTs. The following year, my colleague Albert Padró-Solanet and I adapted some of that research and turned into a set of training sessions for city council officers in the field of communication, participation and environment, the latter being a field in which collaboration between institutions and organizations at the city level is crucial. 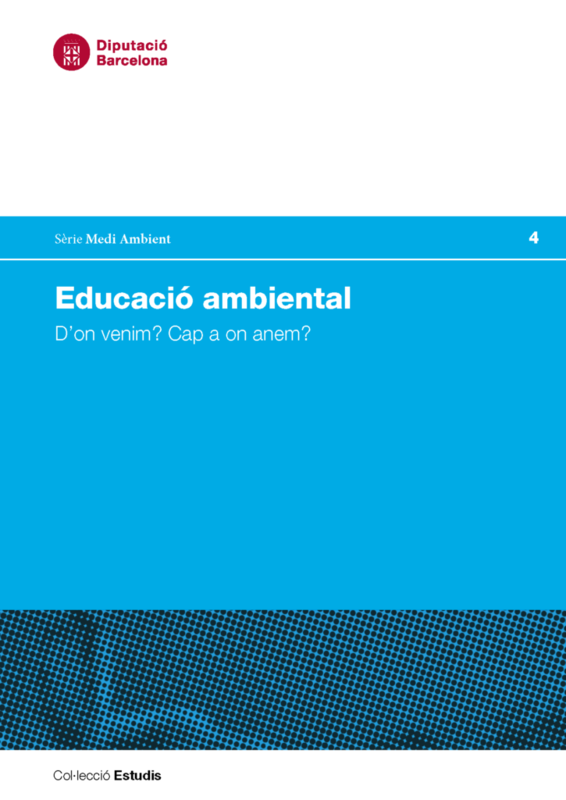 The Technical office of education and environmental promotion of the Barcelona County Council has just issued a book, Environmental education. Where have we come from? Where are we going? , in which we were invited to write a book chapter on how environmental education and awareness raising on environmental issues has changed due to the adoption of ICTs. Our chapter — Environmental education in a world of networks — begins with an introduction to the digital revolution and the kinds of tools and applications that are more deeply changing information and communication between citizens and between citizens and public administrations. Of course, the list of specific applications will quickly be outdated, but the reflections around them and their categorization we believe will still be useful in the following years. After the digital revolution and some tools, we talk about the communication plan, how to identify our targets, how to campaign or how to think of communication as a way of building up a project-centered personal learning environment (PLE — in this case, the P would stand for project instead of personal). The chapter ends with some practical cases and some conclusions or things to keep in mind. The book — and the book chapters — is published in Catalan, Spanish and English, and our chapter can be downloaded below. Peña-López, I. & Padró-Solanet, A. (2017). “Environmental education in a world of networks”. In Diputació de Barcelona, Environmental education. Where have we come from? Where are we going?, Chapter 11, 544-559. Col·lecció Estudis. Sèrie Medi Ambient, 4. Barcelona: Diputació de Barcelona. Peña-López, I. & Padró-Solanet, A. (2017). “Educación ambiental en un mundo de redes”. En Diputació de Barcelona, Educación ambiental. ¿De dónde venimos? ¿Hacia dónde vamos?, Capítol 11, 397-414. Col·lecció Estudis. Sèrie Medi Ambient, 4. Barcelona: Diputació de Barcelona. Peña-López, I. & Padró-Solanet, A. (2017). “Educación ambiental en un mundo de redes”. A Diputació de Barcelona, Educació ambiental. D’on venim? Cap a on anem?, Capítol 11, 231-257. Col·lecció Estudis. Sèrie Medi Ambient, 4. Barcelona: Diputació de Barcelona. 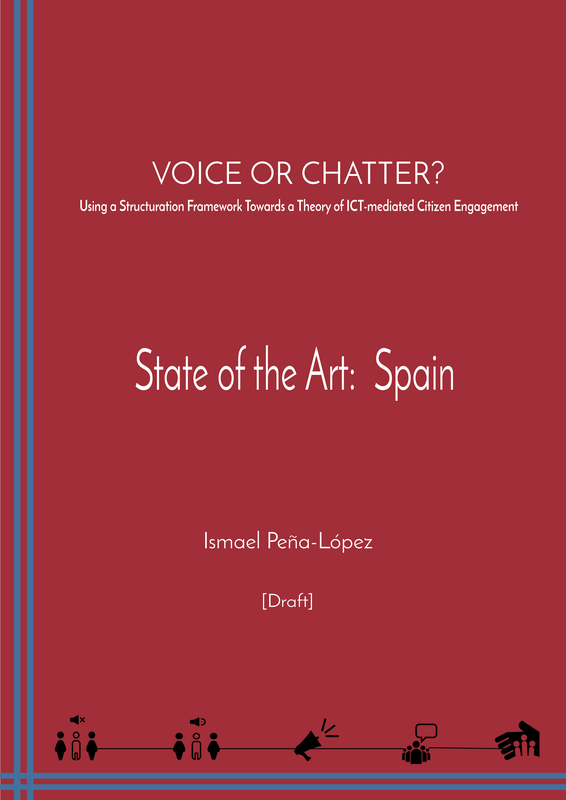 This report aims at providing an overview of the normative and institutional state of art of ICT-mediated citizen participation in Spain. The first section provides an overview of the political and civic liberties framework in Spain. In the second section the landscape of ICT mediated citizen engagement is mapped. In the third section, the report engages with implications of technology mediations for deliberative democracy and transformative citizenship. This report is the outcome of a collaboration between IT for Change and Ismael Peña-López, School of Law and Political Science, Universitat Oberta de Catalunya under a research project titled Voice or Chatter? Using a Structuration Framework Towards a Theory of ICT-mediated Citizen Engagement . The State of the Art reports provide an overview of the normative and institutional state of art of ICT-mediated citizen participation in various countries. They provide an overview of the political and civic liberties framework, the landscape of ICT-mediated citizen engagement; and delve into the implications of technology mediations for deliberative democracy and transformative citizenship. A former version of this report was released as a working paper as Technopolitics, ICT-based participation in municipalities and the makings of a network of open cities. Drafting the state of the art and the case of decidim.Barcelona . This research has been produced with the financial support of Making All Voices Count. Making All Voices Count is a programme working towards a world in which open, effective and participatory governance is the norm and not the exception. This Grand Challenge focuses global attention on creative and cutting-edge solutions to transform the relationship between citizens and their governments. Making All Voices Count is supported by the U.K. Department for International Development (DFID), U.S. Agency for International Development (USAID), Swedish International Development Cooperation Agency, and Omidyar Network (ON), and is implemented by a consortium consisting of Hivos, the Institute of Development Studies (IDS) and Ushahidi. The programme is inspired by and supports the goals of the Open Government Partnership. The author wants to thank the guidance, thorough review and suggestions made by Deepti Bharthur, Nandini Chami and Anita Gurumurthy from IT for Change. The author also wants to thank the indispensable help from Arnau Monterde from UOC/IN3.